A native Tucsonan, Billy Lopez is one of 13 children of Antonio and Emilla Lopez, immigrants from Mexico. He was educated entirely in TUSD schools, including Borten Elementary, Safford Junior High and Tucson High School, where he was a two-year letterman in football and track under Jason Green, John Mallamo and Gale Bell. Billy began his coaching career at All Saint’s School while attending the UA. He graduated from NAU where he attained a bachelor’s degree in physical education and a Master’s in Spanish. He taught for four years at Prescott High School and was freshman football, basketball, wrestling and track coach. Billy started teaching at Sahuaro High School in 1969 where he also coached freshman football for 25 years and wrestling for 20 years. Billy has been coaching Sahuaro’s varsity softball team, has been Coach of the Year three times and his teams have won five state championships. 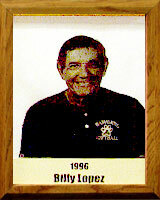 He also was selected 1995 Regional Coach of the Year for the 4A Kino Division. Billy says some of his greatest memories include his association with great coaches such as Bill Lovin, Elmer Carrier, Jason Greer, Gale Bell, John Mallamo, Virgil Stan and Roger Hightower. He also treasures his relationship with his family, especially his older brothers and sisters, and with such life-long friends as John Knox and Tom Pierson. He says he will always remember Chick Hawkins, who gave him his first football in 1948 at the old Fox Theater downtown.